The NESC horizontal clearance requirement for electrical lines running adjacent to buildings is 7.5 feet. The clearance is 7.5 feet whether the electrical line runs next to a wall, a guarded window, or an unguarded window or balcony. Heat or ice load can affect the sag of the electrical line. The NESC requires that this be taken into account and the electrical line must meet the required clearance at the maximum temperature of 120°F and with ice loading at 32°F. The electrical line with not be compliant with NESC unless it meets clearance under these conditions. If you see a broken or low hanging wire over a building or hanging very close next to a building, you should call the utility company or 9-1-1. 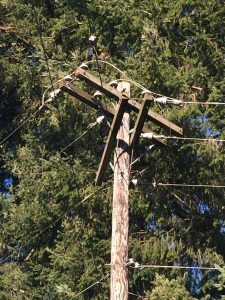 The utility company will be able to safely raise the wire to meet required clearances. You should never touch an electrical wire. Physical contact with a live powerline can electrical shock and be lethal. You should call the experienced injury attorneys at Kraft Davies, if you are injured from an electrical line. The utility company or third party could be held responsible if the electrical line did not meet required clearances under the NESC. You may be entitled to certain damages and compensation. You should not delay in contacting an attorney, because electrical line clearances are time sensitive and it is vital that the attorneys go to the scene as soon as possible after the electrical shock or death before the power company has an opportunity to make changes to the scene or change the evidence. It is important to determine not only which code or standard is applicable, but whether the electrical line has been changed or the incident environment changed. Our personal injury attorneys have decades of experience in personal injury litigation and are ready to help evaluate your claim. Please call our office at (206) 624-8844 or contact us through this website for a free case evaluation.